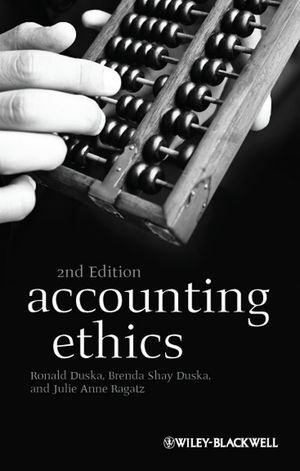 Accounting Ethics uses concrete examples and case studies, including current situations such as the Enron/Arthur Andersen debacle, to examine the ethical responsibilities of individual accountants as well as accounting firms. Offers a comprehensive overview of ethics in accounting, as well as an examination of and recommendations for solving the current crisis in this field. Investigates the nature and purpose of accounting. Uses concrete examples and case studies, including current situations such as the Enron/Arthur Andersen debacle. Examines the ethical responsibilities of individual accountants as well as accounting firms . Ronald F. Duska is Professor of Ethics and holder of the Charles Lamont Post Chair of Ethics and the Professions at The American College, Bryn Mawr, PA.
Brenda Shay Duska MT, CPA, is Vice-President of Finance and Administration at Rosemont College, and has extensive experience both as an auditor and tax-accountant with various accounting firms, most recently Del Pizzo & Associates, PC. Enron, Arthur Andersen, and the Financial Markets: A Chronology of Wall Street Journal Articles. And then there was WorldCom. 1. The Nature of Accounting and the Chief Ethical Difficulty: True Disclosure. 2. Ethical Behavior in Accounting: What is Ethics?. 3. Ethical Behavior in accounting: Ethical Theory. 4. Accounting as a Profession. 5. Accounting Codes of Ethics: The Principles. 6. Accounting Codes of Ethics: The Rules. 7. Ethics in Auditing: The Auditing Function. 8. The Ethics of Managerial and Financial Accounting. 9. The Ethics of Tax Accounting. 10. The Ethics of the Accounting Firm; The Accounting Profession in Crisis. Appendix I: The Code of Professional Conduct of the American Institute of Certified Public Accountants. Appendix II: Institute of Management Accountants: Ethical Standards. Appendix III: Statement on Auditing Standards: A Summary. Appendix IV: Revision of the Securities and Exchange Commission's Auditor Independence Requirements. Appendix V: Statements on Standards for Tax Services Nos 1-8. "Accounting Ethics is a book for our troubled times. 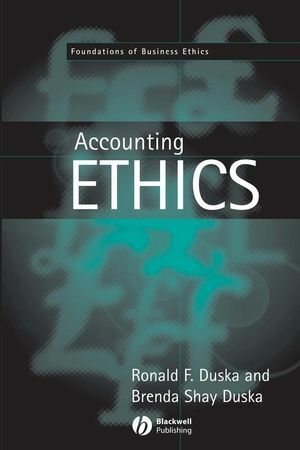 The Duskas provide a basic primer on ethics for accounting that is helpful to accountants and non-accountants alike. They deftly weave the saga of Enron and Arthur Andersen through a practical and realistic presentation of accounting ethics." "This book is a long awaited and significant contribution to business ethics. At last, a book that addresses the full range of accounting, tax, and audit issues, integrating the perspective of the accounting profession with that of a trained ethicist. This is a must-read for everyone in the accounting profession and in business ethics. Bravo Duskas!" "Accounting Ethics offers a superb, accessible introduction to the traditions and responsibilities of individual accountants and their firms." "... the author's clear, practical, and jargon-free presentation makes this book a valuable resource or nonaccountants and required reading for every accountant and student of accounting." "...this textbook is likely to be very useful. It is easy to read, informative and provides a good base for discussion." "As a guide to the basic issues and ideas concerning ethics for students with little prior exposure to the debates in accounting and the theories in ethics, this text is likely to be very useful. It is easy to read, informative and provides a good base for discussion."